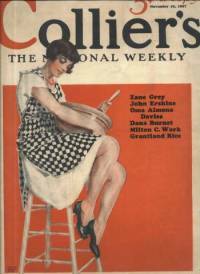 I had the idea for this page when I was composing the auction listings for this particular run of late 1920’s Collier’s Magazines. 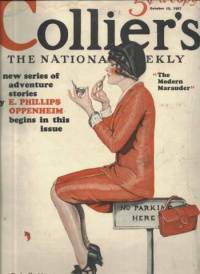 I acquired these issues of Collier’s as a near complete mini-run dating October 8, 1927 through January 8, 1928 (missing only the December 17 issue). When I listed these at auction I paged through every page of each issue so that my listings could include every single story and author listed inside along with the illustrators and any interesting descriptive notes about an article that just copying the title from the index page would not make clear. Note: This is an idea I’ve followed through ever since which led to the birth of the magawiki, a site containing listings of thousands of different magazine contents. The next step to this page developed in the eleventh hour of putting together the third issue of Random Issues, this site’s monthly newsletter. I had originally planned on detailing a 1942 issue of LOOK in that issue, but then I realized that each of the first two issues already detailed magazines from the World War II era. 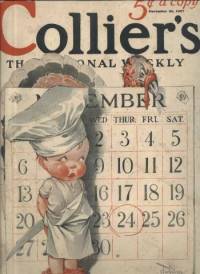 That seemed a little stale to me, so I settled on the December 24, 1927 issue of Collier’s for the third issue. It occurred to me that since I would be completely dissecting that individual issue and archiving my findings on this site, that it might be interesting to include a briefer overview of the other issues from the batch. If minute detail for one issue is intended to give a better look at both a time in history and the way a particular publication covered it, then an abstract of several consecutive issues from that same period might further clarify what I am trying to accomplish. So that’s how this page came to be. What you will find below is a cover image for each issue accompanied by the complete listing of contents from the index plus any other interesting information that I came across along the way. 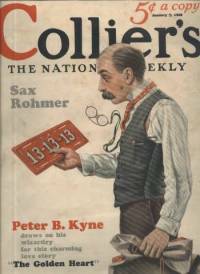 Collier’s Magazine during this period seemed to include about two-thirds fiction with the remainder of its contents being a special article or two along with the regular features. There was a two-page photo spread in each issue. Each of these spreads was themed, given a title which was followed in the index by the words “in pictures”. The last page for each issue was for Editorials and other semi-regular features included Jack Binns’ radio column “Picked Out of the Air”, a bridge column by Milton C. Work titled “How Would You Play It?”, a political column which was titled differently each issue but authored by The Gentleman at the Keyhole, and the famed column by legendary sportswriter Grantland Rice. A fun feature during this period were Nameographs (samples of which can be seen in my Random Issues article about the December 24 issue). Nameographs were clever images constructed out of the letters of the word, or more often, name, that they were describing. For instance one Nameograph was an image of a generic tennis player, however if you examine the image carefully you see that the image is created out of the letters in famed tennis star Bill Tilden’s name. Collier’s paid subscribers $5.00 for each Nameograph accepted for publication. Much of the fiction was serialized at this point. 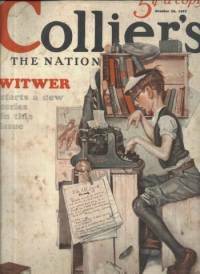 Many of these issues contain a portion of “The Water Hole” by Zane Grey, which was a novel published in Collier’s in its entirety over several weeks. 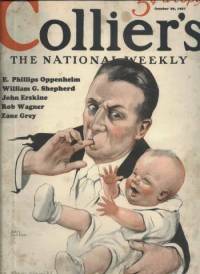 Other fiction writers in these issues included Fu Manchu creator Sax Rohmer, Albert Payson Terhune, E. Phillips Oppenheim, H.C. Witwer, and Ruth Burr Sanborn, who were all standard magazine authors of this period. Illustrators were attached to projects over several issues. You’ll notice that all of the Zane Grey fiction is illustrated by Harold Brett, John Erskine’s serialized “Adam and Eve” has Frank Godwin illustrations, and all of the Sax Rohmer stories include R.L. Lambdin artwork. I purposely did not name the cover artists for these issues, because truth be told I could not identify them all and did not want to present a listing so obviously incomplete. I will say however that the November 5 issue’s cover was illustrated by the popular W.T. Benda. The Water Hole by Zane Grey. The opening chapter of a new novel of the West’s most popular writer. Illustrated by Harold Brett. Our Jungle Passions. An article by Kathleen Norris. Illustrated by W.J. Enright. Carousel by Dana Burnet. A love story in which the plot turns on a merry-go-round. Illustrated by John H. Crosman. Write Your Own Titles in pictures. Includes 2-1/2″ X 4-1/4″ photos of films stars Helene Chadwick, Renee Adoree, Harry Langdon, and Moran. The Fire Warden a short story by Ernest Poole. An old man’s courage saves his son. Illustrated by Zack Hogg. The Victims and Their Spoils by Al Demaree. A former big leaguer takes you behind the scenes. New Wine by Gladys St. John-Loe. A shorts story of a great experiment. Illustrated by T.D. Skidmore. Guiding the Stars by Hugh Leamy. An interview with Herbert Brenon. Includes pictures of film stars Alice Joyce & Anna Q. Nilsson, Tom Moore & Betty Bronson, Rudolph Valentino & Vilma Banky in Son of the Sheik. His Name in Lights a short shorts story by Octavus Roy Cohen. Illustrated by Frank Godwin. Parade Everlasting by John B. Kennedy. It’s a great job the Prince of Wales has! Adam and Eve by John Erskine. The new novel by the author of “The Private Life of Helen of Troy”. Illustrated by Frank Godwin. I Never Could Eat That by Ruth F. Wadsworth, MD. Exploding some ancient food superstitions. Illustrated by Reginald Birch. The Modern Maruader a short story by E. Phillips Oppenheim. The first of the surprising adventures of Major Forester. Illustrated by T.D. Skidmore. Where the Booze Begins by Major Chester P. Mills. A former prohibition administrator tells about denatured alcohol. Caged by Alfred Klein. A true story by a veteran guide and hunter. New Life, New Love by Richard Washburn Child. A short story about the loyalty of a good woman. Illustrated by R.V. Culter. The Fighting Heart a short short story by George F. Worts. Illustrated by Philip Reisman. A Good Egg from Sweden by Tom A. Burke. On tour with Prince William of Sweden. Glamour a short story by Ruth Hawthorne. There is a time when the spotlight ceases to thrill. Illustrated by L.T. Wilford. The Water Hole a new novel by Zane Grey. Illustrated by Harold Brett. There Ought to Be a Law by Merle Thorpe. The Editor of “The Nation’s Business” shows you the wheels in the law mills. Adam and Eve by John Erskine. The newest thing in fiction- everybody’s reading it. Illustrated by Frank Godwin. Ripe Old Youth an article by Grantland Rice with pictures of Betty Nuthall. Furnace Brains by Edward K. Douglas. Suggestions to help you get more heat with less coal. Illustrated by Kurt Wiese. Picked Out of the Air by Jack Binns. Ladies Prefer Brunettes by H.C. Witwer, The first of a new series of stories “Bigger and Better”. Illustrated by R. Van Buren. The Best is Yet to Be by Edwin E. Slosson. The Director of Science Service tells how chemistry is working for us. Illustrated by Arthur Edrop. Gridiron Grief by Grantland Rice. So He Took the $50,000 by Ruth Burr Sanborn. A gay and diverting story of love and real estate. Illustrated by John H. Crosman. Lobster and Ice Cream by Ruth F. Wadsworth, MD. Some food superstitions knocked into a cocked hat. Illustrated by Reginald Birch. The Water Hole by Zane Grey. A new novel – with synopsis if you happened to miss the beginning. Illustrated by Harold Brett. Verdun Belle by Alexander Woolcott. A war story without an ending – unless you know it. Illustrated by Otto Cushing. Better Than Big Money in pictures includes a photo of Babe Ruth in uniform with some children, Charles Lindbergh, Helen Wills, and Sergeant York. The Golden Vanity by Albert Richard Wetjen. A sea story of youth and courage and hard work. Illustrated by Charles Sarka. Adam and Eve by John Erskine. Eve appears and the triangle takes shape. Illustrated by Frank Godwin. Old Tricks a short short story by Parkhurst Whitney. Illustrated by August Henkel. Decorations by Laurie York Erskine. A thrilling short story of an air raid. Illustrated by Harvey Dunn. The Dean of Custard College by Rob Wagner. A close-up of the screen’s greatest comedy maker (Mack Sennett). With photos of Mack Sennett, Ben Turpin, Gloria Swanson, Mack Swain and others. Pounds of Flesh a short short story by Ben Ames Williams. Illustrated by C.M. Sexton. Marts and Flowers by Hugh Leamy. Useful things to know when you visit your florist. Why Your Credit Is Good by William G. Shepherd. An article about “spaced payments” for everyone who spends money. Illustrated by R.V. Culter. “On the Air” in pictures. Adam and Eve a new novel by John Erskine. Adam try to teach Eve to swim, with disastrous results. Illustrated by Frank Godwin. 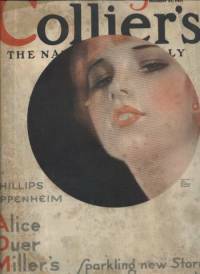 The Siren of the Madrid a short story by E. Phillips Oppenheim. Marjor Forester helps the police preserve their reputation. Illustrated by T.D. Skidmore. Between Drinks by Owen P. White. The true story of Mr. John Glanton, who knew what he wanted. Illustrated by Paul Brown. Eating to Win by Grantland Rice with a photo of Christy Mathewson. The Pioneer: Or, A Lover Rewarded by Elsie Singmaster, a short story in which the hero takes the safe course. Illustrated by Kurt Wiese. 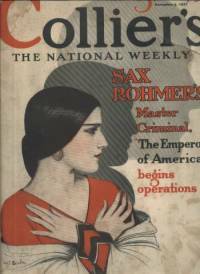 The Emperor of America by Sax Rohmer. The first of a series of thrilling adventure stories. Illustrated by R.L. Lambdin. For Landing’s Sake by Walter Davenport. We’re up in the air and can’t get down. Be Your Age! and article by Ruth F. Wadsworth, MD. Illustrated by Reginald Birch. An Errand for Cousin Laura a short story by Ruth Burr Sanborn. Illustrated by R.V. Culter. The Dean of Custard College by Rob Wagner about Mack Sennett with photos of Sennett, Natalie Kingston, Harry Langdon, Charlie Chaplin, Louise Fazenda, Phyllis Haver, Marie Prevost and Vera Reynolds. Adam and Eve a novel by John Erskine. Illustrated by Frank Godwin. The Monarch and the Mongrel a short short story by Walter Greenough. Illustrated by Herman Palmer. –And Severest Critics in pictures has photos of authors wives. Photo of Octavus Roy Cohen & wife, Mr. & Mrs. Albert Terhune Payson, Lady Conan Doyle, Mrs. Zane Grey, Mrs. A.A. Milne and others. Straight-Art Stuff by Lawrence Perry. A short story of football and business. Illustrated by Herbert Morton Stoops. The Water Hole. Zane Grey’s new western story. Illustrated by Harold Brett. Bribery! by Major Chester P. Mills. The revelations of a former Prohibition Administrator. Gentleman Gene by Grantland Rice about Gene Tunney with photo. It’s Your Bid by John B. Kennedy. An interview with Milton C. Work, bridge authority. The Battery a short war story by Llewellyn Hughes. Illustrated by Paul Brown. The Star Makers by Grantland Rice includes photos of Fleet-footed Flanagan of Notre Dame, Jake Slagle, and Jess Hawley. 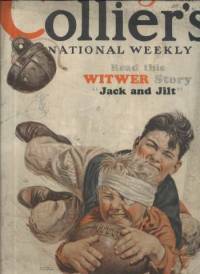 Jack and Jilt a short story by H.C. Witwer. Illustrated by R. Van Buren. And Very Natural a short short story by Parkhurst Whitney. Illustrated by R.V. Culter. The Fugitive of Adelphi Terrace by E. Phillips Openheim. An adventure of Major Forester. Illustrated by T.D. Skidmore. In Sheep’s Clothing in pictures. Includes pics of Wilton Lackaye, Adolphe Menjou, James Rennie, Roy D’Arcy, Jean Hersholt, and others. Just What a Man Needs a love story by Stephen Morehouse Avery. Illustrated by R. John Holmgren. The Water Hole a new novel with synopsis by Zane Grey. Illustrated by Harold Brett. The Price of Scotch a short story by William Slavens McNutt. Illustrated by W.L. Barnes. The Halfback of Notre Dame by John B. Kennedy. An interview with Knute Rockne with photos of Rockne and the Four Horsemen of Notre Dame. What’ll I Give Her? by Hazel Rawson Cades. A little advice for husbands and boy friends. Illustrated by Jefferson Machamer. The Diamond Z. by Sax Rohmer. Another encounter with the Emperor of America. Illustrated by R.L. Lambdin. A Matter of Policy in pictures. Includes photos of Dot Farley & Ben Turpin and Charlie Chaplin (from behind). What Every Fan Knows by Grantland Rice with a Rene Lacoste photo. A Business Engagement a love story by Dana Burnet. Illustrated by Chales Lassel. The Water Hole by Zane Grey. A new novel with synopsis. Illustrated by Harold Brett. Adam and Eve by John Erskine. The great new novel by the author of The Private Life of Helen of Troy. Illustrated by Frank Godwin. Late Party a short short story by Fleta Campbell Springer. Illustrated by Reginald Birch. Dizzy But Undaunted by Rob Wagner. The truth about dare-devil stunts in the movies. With a photo of Gloria Swanson and another of Anna Q. Nilsson. One-Eye Connelly by John B. Kennedy and illustrated by R. Van Buren. Shop Alone by Elizabeth MacDonald Osborne. Good advice for the girls. Illustrated by Jefferson Machamer. Adam and Eve by John Erskine. The new novel by the autor of “Helen of Troy”. Illustrated by Frank Godwin. Young Love a short story by Arthur Somers Roche. Drawing by Walter Reach Humphrey. 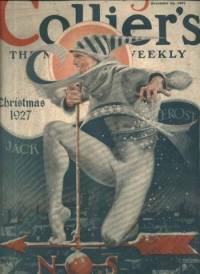 The Christmas Business by John T. Flynn. It goes on all year round. All Work and No Fay by H.C. Witwer. Another reel in “Bigger and Better”. Illustrated by R. Van Buren. 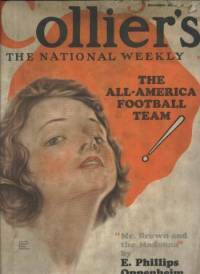 It’s Really “All-America” Now by Grantland Rice with photos of Walter Camp and Caspar Whitney. Thorn Apple by Sax Rohmer. The Emperor of America comes out ahead. Illustrated by R.L. Lambdin. For Women Only by Marie Beynon Ray. Illustrated by Harve Stein. The Brand Burners by Owen P. White. The Old West is still with us. Illustrated by Paul Brown. Just a Minute by Mella Russell McCallum. One little glance changes a life. Illustrated by William Fisher. Admission Five Cents in pictures is two-page photo spread about the early days of movies. Photos include: Dorothy Gish, Alice Joyce, Pearl White, Florence Vidor, Charles Ray, Theda Bara, Douglas Fairbanks, Jack Warren Kerrigan, Snub Pollard with Bebe Daniels & Harold Lloyd, Lon Chaney in “The Sheriff of Something”, Mary Pickford and a couple of others. The Remembering Eye a short short story by Ernest Poole. Illustrated by Kurt Wiese. Birds Aren’t So Wild by John B. Kennedy. The story of Jack Miner and his bird sanctuary. The Water Hole by Zane Grey. Illustrated by Harold Brett. The Happy Man a new novel by Stacy Aumonier. Football’s Hall of Fame – A listing of all All-America selections from 1889-1926 with a photo of E.A. Poe of Princeton, 1889. The All-America Football Selections by Grantland Rice with pictures of Morley Drury, Jack Connor, Gilbert Welch, Herbert Joesting, C.K. Cagle, Harold Hanson, John D. Charlesworth, I.C. Shivar, John SMith, Leo Raskowski, John Smith, and Bennie Oosterbaan. Nothing Ever Happens a short story by Bernice Brown and illustrated by R. Van Buren. Mirrors of the Jungle by Mrs. Martin Johnson. Revealing the human traits of wild beasts. Photos by Martin Johnson. Hey! Hey! Charleston! by Bee Jackson. Showing just where the blame lies. With a large photo of Jackson. Respectable Weddings by Rev. Caleb R. Stetson. Illustrated by Reginald Birch. The Well-Groomed Look by Elizabeth MacDonald Osborn with a photo of Carmel Myers. Mr. Brown and the Madonna a short story by E. Phillips Oppenheim. Major Forester adds another yarn to his collection. Illustrated by T.D. Skidmore. A Free Immoral Agent a short story by Oma Almona Davies. Illustrated by Kurt Wiese. The Happy Man a novel by Stacy Aumonier. Illustrated by W.L. Barnes. Edgar Ain’t Wuth It a short story by Ernest Poole. Illustrated by John Alan Maxwell. Money on the Tongue a short short story by George S. Brooks. Illustrated by C.M. Sexton. 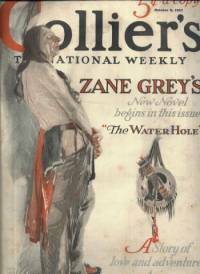 The Water Hole by Zane Grey. The latest sotry by the West’s popular novelist. Illustrated by Harold Brett. This is the one issue in this run that was missing. Welcome Home by Alice Duer Miller. A romantic new novel. Illustrated by Jules Gotleib. Wide Open by Walter Davenport. The lid is still off in Chicago. The Tricker a short story by Roark Bradford. Illustrated by Harry Burne. What’s Ahead for Crowns by Grantland Rice with photos of Rene Lacoste, Walter Hagen, and Helen Wills. If I Hadn’t Married You a short short story by Don Marquis. Illustrated by R.V. Culter. Why Antiques Are Worth It by Rose Feld with photos of Chippendale and Duncan Phyfe pieces. 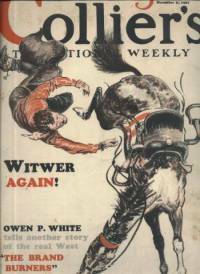 Lily the Lion Tamer a love story by Owen P. White. Illustrated by Charles Sarka. The Valley Girl by Albert Payson Terhune. A new novel with synopsis. Illustrated by Harold Von Schmidt. The Golden Heart a short story by Peter B. Kyne. Illustrated by William de Leftwich Dodge. The Whip Hand by William G. Shepherd. A visit to the Klan floggers of Alabama with illustrations and photos of klansman and victims. Nerves to Spare by Grantland Rice with photos of New York Yankees Herb Pennock and Gene Tunney. At the Road House by Sax Rohmer. Another adventure with the Emperor of America. Illustrated by R.L. Lambdin. The Third Lady an article by Nathalie Sedgwick Colby. Welcome Home a new romantic comedy by Alice Duer Miller. Illustrated by Jules Gotlieb. “Thar’s Gold in Them Hills!” a short short story by Don Marquis. Illustrated by Cornelius Hicks. The Great Poodle Myth a short story by Guy Gilpatric. Illustrated by Austin Eugene Briggs. The Stars and Types by Uncle Henry. One Man in a Million a love story by Carol Denny Hill. Illustrated by Robb Beebe. The Valley Girl a new novel by Albert Payson Terhune. Illustrated by Harold Von Schmidt. Wasted Millions by Dr. William J. Hale. How the “farm problem” might be solved. Not So Hard in pictures. Suds from Sudbury by The Gentleman at the Keyhole.